New York has really been in the heat of summer recently – a heat wave, to be exact. So what better time to leave the sweaty streets and hit the beach, right? I love Rockaway Beach because you can get to it by subway. No expensive Long Island Railroad tickets, no car rental, no fee charged to go on the beach! 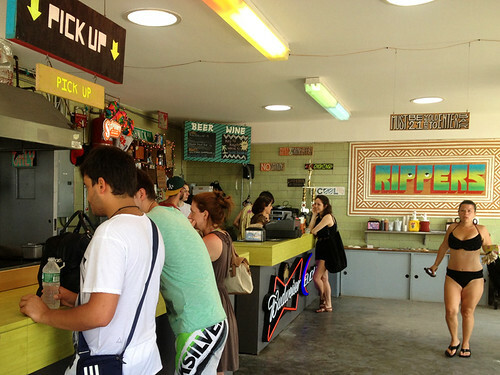 And I love going to Rockaway Taco for lunch while I’m there, because their tofu tacos are amazing. But since parts of the beach and the boardwalk are still being repaired after Hurricane Sandy, we ended up walking down to 86th street to get to the beach because you are not allowed to swim at 98th street (the subway stop I usually get off at, the closest one to Rockaway Taco) while construction is still going on. 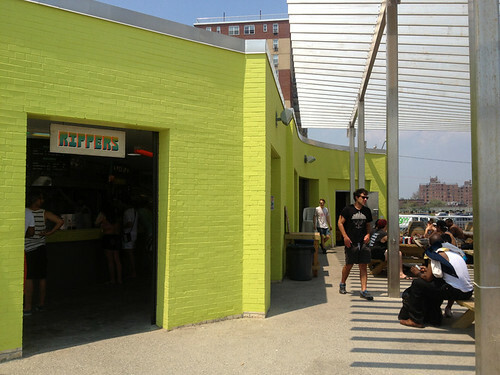 At 86th Street, the boardwalk has been repaired, and Rippers has rebuilt its burger stand. And guess what? They have a veggie burger on the menu! I was going to order avocado ($1.50 extra) on top of my veggie burger, but then the girl taking our order said that the veggie burger already comes with avocado – now that’s what I like to hear! It also comes with fresh tomato slices, pickles, and some kind of green sauce which I couldn’t identify, that had a mild, sweet flavor. 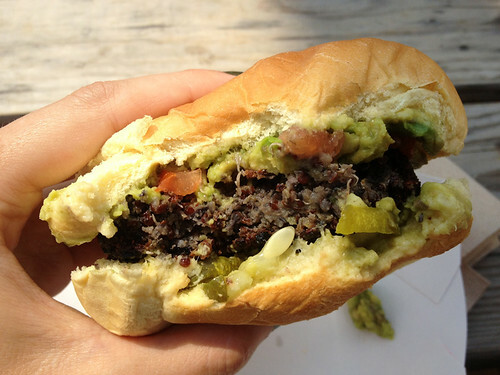 The patty is made (homemade, I should add) with black beans and quinoa – and fried to a great, crunchy crisp on the outside, It held together incredibly well, was soft on the inside, and had a hearty flavor. 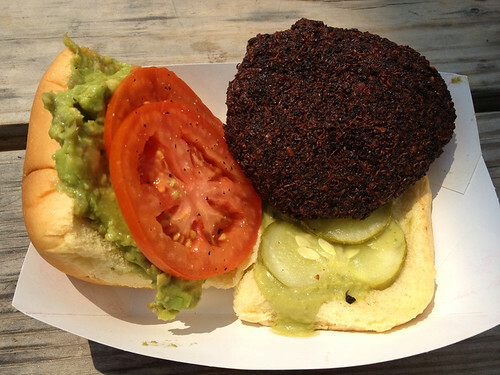 I love black beans and quinoa, but this might be the first time I have seen the two of them together as co-stars in a burger patty (it’s a brilliant idea!). The bun was soft, and fresh, but just your standard pre-packaged hamburger bun. It got a bit mushy on the bottom, with the liquid of the sauce and pickles, but the whole thing was still so tasty. I was really quite surprised by how good it was - I had been expecting the typical “hockey-puck” frozen veggie burger patty that restaurants offer as an afterthought to a menu of meat-burgers. But great care had clearly gone into the creation of this delicious veggie burger, and it made a great day at the beach even better! Is it vegan? (I always try to find out for my vegan readers!) The girl who took our order said “I think so, it’s just quinoa and black beans”. It’s possible those were the only ingredients (plus some spices maybe?) 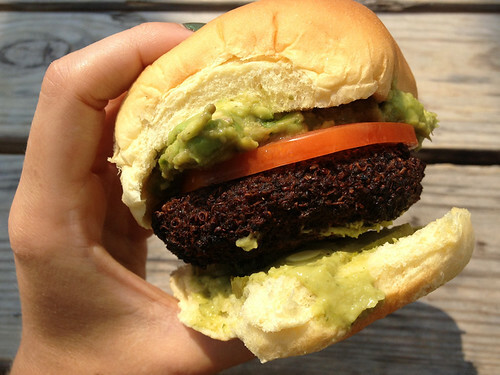 but I’d definitely recommend asking for more information if you are vegan and want to eat this burger. I’m also not sure if the bun or the sauce would be vegan. 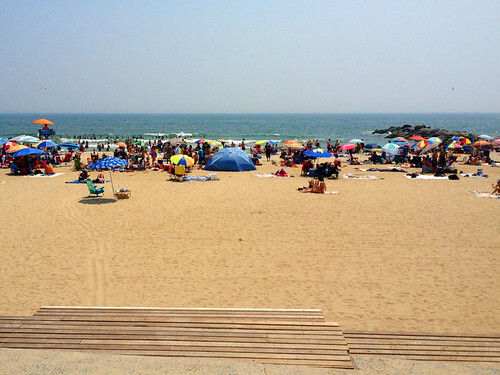 Now Rippers and Rockaway Taco might be tied for my affections… I guess I’ll just have to go to the beach a lot more before the end of the summer, to give each a fair share of my attention and appetite! Yum, that looks so good! I've never been to Rockaway beach, but I've heard so much about the tacos there. I will definitely have to for tacos and that burger!! !